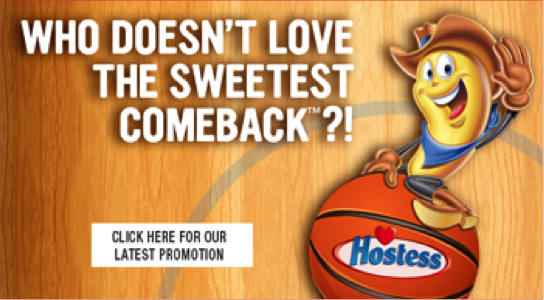 After returning to market with The Sweetest Comeback in the History of Ever campaign, Hostess was looking for a compelling March program that would get retailers excited and keep the momentum going. We developed a bracket challenge celebrating the sweetest comebacks in college basketball history. Users submitted their favorite games and each week, they went head-to-head until one game was crowned the victor. Voters entered for a chance to win cash prizes each week. Created co-branded packaging of multipack and single serve Twinkies, Chocolate and Orange CupCakes, and four flavors of bagged Donettes. Designed co-branded displays and POS materials. Hosted an online bracket challenge sweepstakes. Gave away weekly cash prizes. Awarded one grand prize winner with $5,000. Created custom Facebook posts and ads.